Jesse James and Kat Von D in better days. 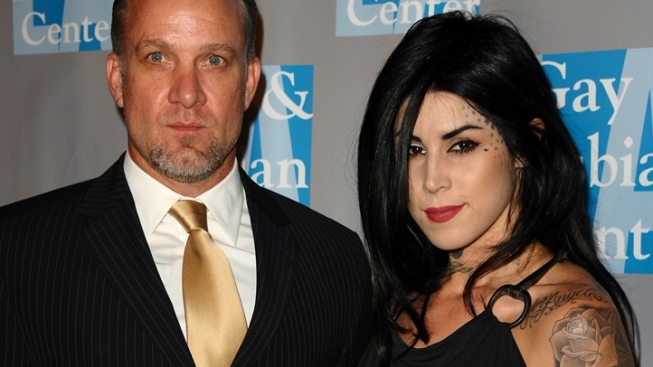 Kat Von D and Jesse James announced they had broken up on Monday, following a six-month engagement. Just two days later, a clip from the upcoming season of Kat's TLC reality show, "LA Ink," revealed the tattoo maven had gotten Jesse's mug inked onto her torso as a surprise for her now ex-fiance. "I'm really nervous about giving you your surprise," Kat is seen telling Jesse in the clip released on Wednesday, as she pulls her shirt aside to reveal the large tattoo rendering of a photo of Jesse's face from childhood. "You're crazy," Jesse responds, wide-eyed. "Do you love it?" Kat asks. "Yeah, I love you," he answers. VIEW THE PHOTOS: Guess The Celebrity Ink! "I thought you were going to tell me you were breaking up with me," she says, laughing. "Just kidding!" Kat's rough week seemingly went from bad to worse on Wednesday when she walked off the set prior to her interview on "Good Day LA." The reality star left the set of the LA-area morning show prior to her interview after one of the show's hosts mentioned Jesse and Kat's breakup during her introduction (after playing the aforementioned tattoo surprise clip). "Dear GoodDayLA, thanks for the waste of a perfectly good morning. Lack of compassion n respect for each other never fails to dissapoint [sic] me," Kat Tweeted on Wednesday morning after the incident. News of Kat's walk off quickly circulated online, with TMZ's headline claiming, "Kat Von D STORMS OUT of 'Good Day LA'" – an accusation Kat also used Twitter to combat. "My apologies if I've offended anyone this morning," she Tweeted. "For the record: I did not storm off - I politely left w notice when GDLA broke their word. "I didn't walk out because you used the clip we sent you- I walked out because of your disrespectful intro you guys 'snuck in,'" Kat also Tweeted to Jillian Barberie, one of "Good Day LA's" co-hosts. Jillian immediately responded to Kat, Tweeting, "Why was it disrespectful? We said you guys broke up. "We showed the clip your publicist sent. It showed you and Jesse," the co-host added. "Were we not supposed to mention you broke up?" Kat responded with one final comment to Jillian. "ps. Publicly disrespecting people for the sake of better ratings isn't something a person of compassion does," she Tweeted. "Good day.."
Tune in to Access Hollywood Live tomorrow to hear more from Kat herself! PLAY IT NOW: Access Hollywood Live: Were There Signs Of Trouble Before JLo & Marc Anthony Split?